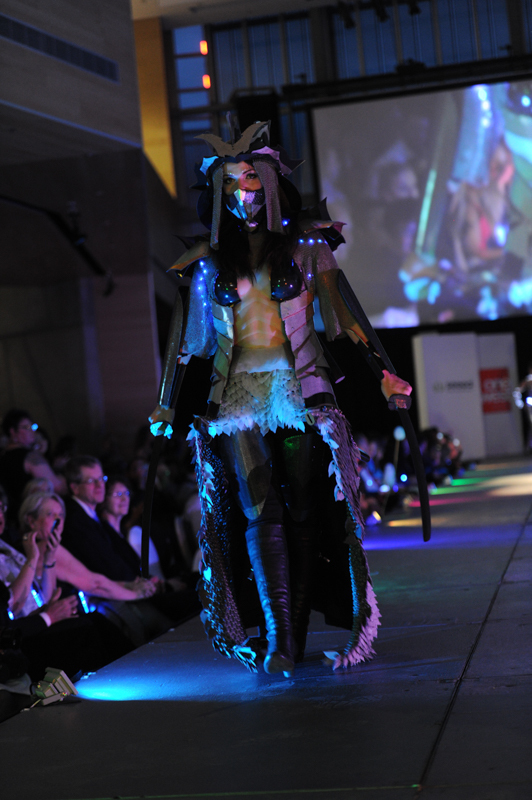 The 3rd annual MakeFashion Gala was a great success, bringing wearable technology fused with design and artistry to the runway. As a non-profit, volunteer-run organization, MakeFashion’s success is made possible by our sponsors and partners. This year our sponsor Absolut Canada went above and beyond in their generosity, not only providing nearly $10,000 value in support for the event, but providing bursaries for our talented designer and engineering teams. During the event, spectators were asked to vote for their favorite pieces via interactive online voting on Twitter and Facebook. The winner of this year’s Audience Choice Award, a $2000 cash bursary, was the Obscure Shadow project. The team includes Matt Jackson Laprairie (designer), Hazel Brandreth (engineer), Alexandra Catrina (model), and Venessa Wedge (model). “It has been such a pleasure and a wild adventure being a part of Makefashion, this is my first year participating in this epic event and sure not to be my last. I look forward to becoming a greater part of the community that surrounds the show and offering the support that was given to me to those that are new for next year. It was an honor to receive the Absolut bursary for this year, it allows me to place that funding directly back into the development of my tech designs. I have very high hopes and aspirations for the next show and funding is always an issue, this makes a head start just that much more possible. In addition to the Audience Choice Award, Absolut Vodka gave a surprise bursary of $500 to all our 2015 teams. Huge thanks to Absolut Canada for your generosity and dedication for elevating the arts and tech in Canada!